On the Colorado River, it's important to be prepared for all types of weather. 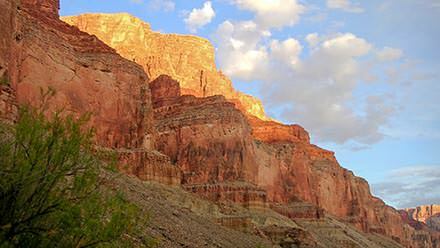 Although the weather in Grand Canyon is warm and sunny for the most part, Mother Nature will occasionally surprise us with a renewing rainstorm or cooler temperatures. Temperatures can vary, but the following chart shows average temperature and precipitation for the months of March through October. Water temperatures in the Colorado River average 50° year round, although side streams and waterfalls where we occasionally stop for hikes can be much warmer. Precipitation .79" .47" .36" .30" .84" 1.4" .97" .65"
Finding the right weather forecast for the Colorado River can be tricky as most sources will report weather on the Rim of Grand Canyon vs. 5,000 feet lower along the river. That elevation can make a big difference! Use this weather forecast only as a general guide. As your trip will span miles of river, this forecast from the nearest major weather station may not be indicative of the entire region where your trip will take place. Weather in the canyon may vary greatly from any specific forecast. 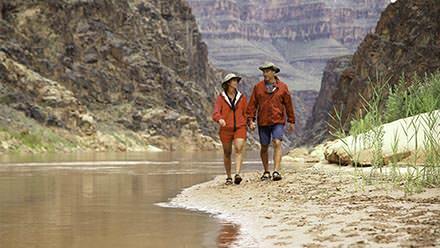 Since weather conditions can be unpredictable and river water in the Grand Canyon is 52°, we recommend having a two-piece rain suit available during the day. You may wish to fold it tightly and keep it in your personal day-use dry bag.